A little boy made the wedding day of two women in Glasgow a teensy bit more special when he saw them leaving their ceremony. Bea Webster and Emma Webster-Mockett tied the knot in a love-filled ceremony on Valentine’s Day 2017, but took to social media on their two-year anniversary to recount one of their favourite memories of the day. 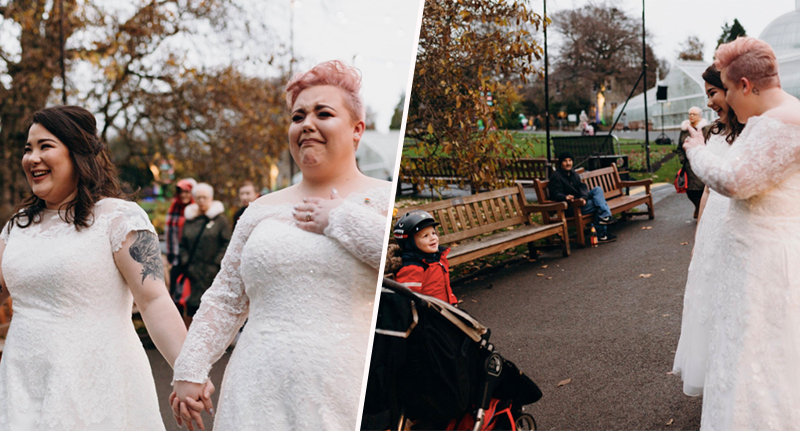 As the happy couple had finished saying their vows and were walking through Glasgow Botanic Gardens for their photos, they bumped into a little boy who couldn’t believe his eyes – he was seeing ‘two princesses’. The little boy excitedly said to his mum, ‘look at those princesses’ as he walked past Bea and Emma on their special day, making their hearts (and mine) melt a little. But it only gets more adorable because he then asked the couple if one of them got married, to which Emma told him they’d just got married to each other. His mum explained how yes, two princesses can marry each other, and the little boy then looked ridiculously excited and happy to have seen them. I mean, just look at him! Emma described on her Instagram page how she was ‘a bit apprehensive’ about having their photos taken in public, and so the little boy’s reaction meant everything to her. I was a bit apprehensive about having our photos taken in public but people were congratulating us and smiling and telling us how beautiful we looked. I’ll never forget this moment. It’s clear to see from the photos – captured by photographer Kirsty McLachlan – how much this moment meant to the two women, who looked emotional and close to tears as they walked away from the little boy. After Bea posted the pictures on Twitter, along with the story of what happened, they immediately went viral and had 104K likes at the time of writing (February 17). Well, that’s me crying into my laptop for the rest of the day.